Over 40 Human Rights organisations from around the world who campaign for peace and justice for the Palestinian people are today sending an open letter to the surviving Beatles, Ringo Starr and Sir Paul McCartney, and to the families of George Harrison and John Lennon, asking them not to accept any invitation to join in this year’s 60th Anniversary celebration of the birth of the state of Israel. An invitation was delivered last week by the Israeli ambassador to Britain, Ron Prosor, during a visit to the Beatles Museum in Liverpool.The letter describes what happened in 1948. This was not a peaceful legally conducted creation of a safe haven for Jews escaping Europe but a brutal ethnic cleansing and massacre of Palestinians and theft of their land. The Zionist movement had set out to claim the whole of Palestine for the creation of a Jewish state long before the Nazi atrocities had occurred. In 1948 they took 78% of the land and brutally exiled or killed 750,000 Palestinians and destroyed over 400 villages- policies and actions that would never have had the support of the Beatles while they were together singing ‘all you need is Love’ and ‘give peace a chance’. We are writing to you to ask you to decline the invitation to join the celebrations marking the birth of the state of Israel in 1948.
the Palestinian land for a Jewish state and 45 % for a Palestinian state. But even that gross settlement was not good enough for the Zionists who had targeted the whole of Palestine for the creation of a Jewish State – long before the Nazi atrocities. So, the Zionists took 78% of the land, brutally exiled or killed over 750,000 Arab Palestinians and destroyed over 400 of their villages in an ethnic cleansing operation that was driven by brutal terrorism. Palestine/Israel is about the size of Wales. Can you imagine what the Welsh would have felt and done if the UN had decided to partition Wales and incomers had ethnically cleansed and massacred Welsh villages? It is not only the Palestinians who remember these days of horror as the Nakba; Israeli historians themselves have documented these events in all their bloody detail. And little has changed since in 1967 Israel seized the remaining Palestinian territory (the West Bank and Gaza) and the brutal occupation continues. The Beatles sang “All you need is love” but Israel believes that all it needs is racism and an army. Is this a policy that would have commanded their support when they were singing together? We don’t think so. The prospect of the surviving Beatles celebrating the Zionist theft of Palestinian land in 1948 is obscene, both for the suffering Palestinian people and for the growing number of British people who support their call for justice. 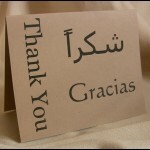 As John put it, it is time to give peace a chance, not to celebrate oppression. Stop the militarisation of the railway! Stop terrorising the train drivers! 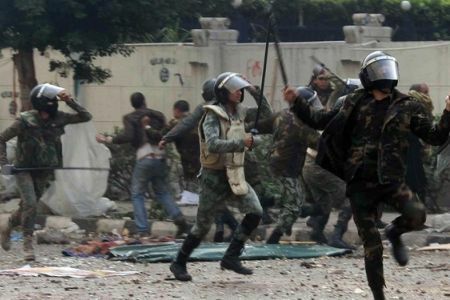 For the first time, the armed forces have blatantly intervened to break the train drivers’ strike – not by force, as in the past, nor through orders to arrest the drivers on charges of striking or incitement to strike (as has already happened to 16 drivers, 13 of them from Tanta), but by issuing call-up papers conscripting hundreds of drivers to work in the Armed Forces’ Transport Directorate. The drivers received orders from the Central Agency for Public Mobilization and Statistics which stated that “it had been decided to assign them to work in a military capacity for the Armed Forces under the Transport Directorate”. The letters stated that drivers who delayed in reporting for duty at the specified place on receiving their assignments would face a six-month jail term or a fine of 5000 Egyptian pounds [£500] or both. To add insult to injury, when the drivers reported to the mobilization centre for Railway Battalion 39 at Masr Railway Station near Al-Sharabiyya Housing, they were suddenly detained, after negotiations between them and representatives of the security services broke down. The drivers called for the cancellation of the orders but this was refused and they were told that the Minister of Transport had refused to take this action. Then the drivers were banned from leaving and they were left without food or drink from the morning of Tuesday 9 April until the time this statement was written. 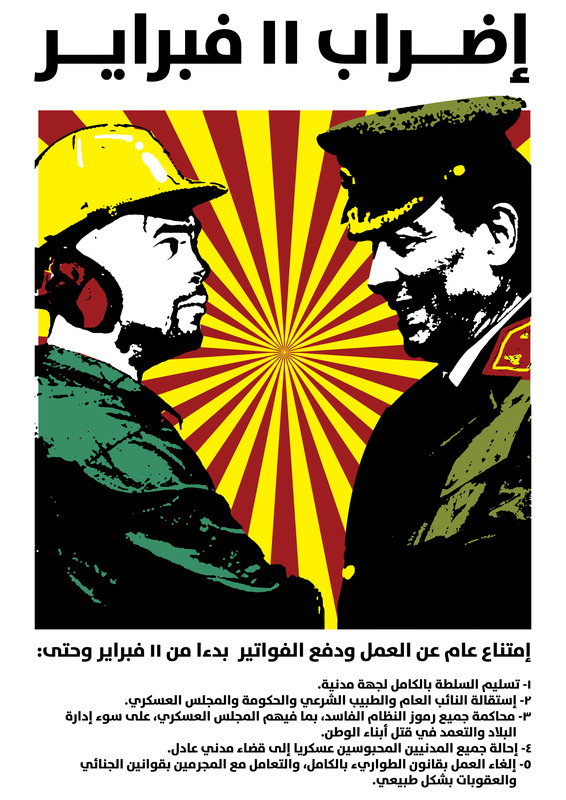 As for the Egyptian government, rather than thinking about how to implement workers’ demands, which are the genuine expression of social justice, one the fundamental slogans of the revolution, it has spent two years experimenting with new ways to try and break the movement. Sometimes it smears the workers, claiming that they are exploiting the revolution for their own sectional demands, and at others it uses all forms of victimisation including dismissals and imprisonment on charges of striking. Despite creating an arsenal of laws criminalising strike action, protests and sit-ins the government has failed to break the workers’ movement by stopping workers’ peaceful strikes and sit-ins to defend their rights. So now it is resorting to illegal imprisonment, for neither the army or the government has the right to conscript anyone, in particular if they are over 35 years old, except in specific circumstances such as war-time. In these situations, the President of the Republic has to issue an order for general mobilization, which has not happened in this case. What is happening here is an attempt to terrorise the drivers from exercising their constitutionally-enshrined right to strike by prosecuting them under military law. The signatories condemn this attempt to militarize the railway, and to terrorize Egyptian workers and the train drivers. We declare our complete solidarity with the drivers’ just demands for their rights. We demand the right for Egyptians to a safe public transport system and to exercise their right to strike. 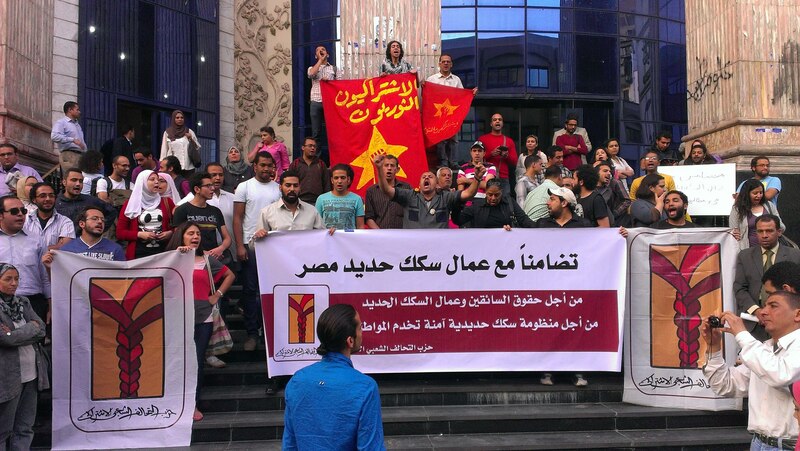 We call on the Egyptian army not to intervene in the workers’ movement, and demand that the Egyptian government takes action to solve workers’ problems and implement their demands, which have long been considered to be fair, rather than attempting to break their movement. The statement below was drafted by Egyptian labor activists. They are seeking signatures from US labor activists. Click here to sign on, or email acpollack2@juno.com. With a general strike by Egyptian workers, students and allies planned for February 11th, a wide distribution and support for this statement will send a clear signal to the Egyptian military regime that we will not stand for any repression of the strikers and that we support their just demands! – Discussing the struggle of Egyptian workers with your workmates. Just as the workers of the ILWU have stood in solidarity with Palestine, we stand with the workers of the ILWU in Longview, Oakland, and everywhere in their struggle to defend workers’ power and stop union-busting. Support the Longview Caravan and stop union-busting! Labor for Palestine expresses its strongest solidarity with the International Longshore and Warehouse Union and its workers in Longview, Washington. ILWU Local 21 in Longview is under attack by a major corporation, EGT, which is running a non-union grain terminal at the port, violating the port agreement with the ILWU, which has governed the port’s operations for over 75 years. The ILWU’s response to this union-busting attempt has been militant and strong, and the center of solidarity from the ongoing Occupy/Decolonize movements. If the ILWU’s jurisdiction is broken at the Port of Longview, union rights are under threat at container ports up and down the West Coast. The ILWU struggle in Longview has drawn the attention and solidarity of popular movements across the U.S. and internationally as a central struggle for workers’ rights, and ILWU Local 10 of the Port of Oakland has been at the center of that organizing. Occupy Oakland, working in solidarity with the ILWU, mobilized 30,000 people on November 2, 2011 to shut down the Port of Oakland in explicit solidarity with the struggle of Longview workers and the longshore workers of Oakland, and ports up and down the West Coast were shut down or protested on December 12, 2011 by Occupy movements in Seattle, Portland, Oakland and elsewhere, again in response to the ILWU battle in Longview. ILWU Local 10 has itself come under attack by the Pacific Maritime Association, pursued in court because of its strong action against the destruction of public workers’ rights to organize in Wisconsin, shutting down the ports of San Francisco and Oakland for 24 hours on April 4, 2011. Despite threats to itself, ILWU Local 10 has once again stood in the front lines with ILWU Local 21 and in defense of the rights of all workers. The workers of Longview have faced massive repression; ILWU Local 21 has only 225 members, but 220 arrests for participating in protests at the port to defend their union’s jurisdiction. They have brought over 1,000 people to the Port of Longview in protest, and inspired the Occupy protest actions at the ports up and down the West Coast. Workers on the West Coast, including ILWU Locals 10 and 21 and the San Francisco and Cowlitz-Wahkiakum County Labor Councils, have announced plans for a caravan to Longview to join the workers in protest when called to action (http://www.transportworkers.org/node/2101). ILWU Local 10′s defense of their sisters and brothers in the Port of Longview reflects a long history of domestic and international solidarity. West Coast dock-workers refused to handle cargo for Nazi Germany (1934) and fascist Italy (1935); refused shipping for apartheid South Africa in the San Francisco Bay Area (1984); and refused to load bombs for the Pinochet dictatorship in Chile (1978). ILWU workers at all twenty-nine West Coast ports held a May Day strike against the wars in Iraq and Afghanistan in 2008. On June 20, 2010, they respected a community picket by refusing to load an Israeli ZIM ship docked at the Port of Oakland. The picket came at the behest of calls from the Palestinian labor movement for boycott, divestment and sanctions and followed in the footsteps of multiple resolutions passed by ILWU Local 10 in support of Palestinian human and workers’ rights. 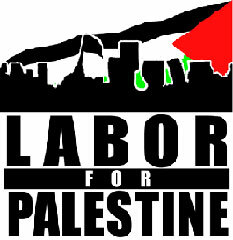 In the same spirit of solidarity, Labor for Palestine supports the call for the Longview Caravan. Just as the workers of the ILWU have stood in solidarity with Palestine, we stand with the workers of the ILWU in Longview, Oakland, and everywhere in their struggle to defend workers’ power and stop union-busting.